With another “Something Wicked This Way Comes” modeled election circus creeping up on us, millions of less-than-enthusiastic constituents are gearing up to vote for their favorite unqualified politician. Inevitably, they’ll resign to choose a leader who doesn’t represent their interests and (to they extent he pays any lip service to those interests at all,) will sell them out the moment he(or she) takes office. Somewhere in a dark room, the brightest republican strategists are working ’round the clock to recruit a black, transgendered, pansexual, Somali, muslim, illegal immigrant candidate in order to distance them from their most loyal conservakin support base and prove once and for all just how inclusive the party is(to people who wouldn’t vote republican if their post-op life depended on it.) Liberal operatives on the other hand, are salivating at the demographic trends which they believe will eventually make it impossible for conservatives to win democratic elections without drifting leftward and abandoning many of their core beliefs. But what would happen to those supposed realities, if we were to stop caring about votes, head for the exits and seek a new political system entirely? Fortunately, a growing number of individuals are becoming aware of the long term idiocratic trends of democracy and starting to question whether it is a viable system at all. Michael Anissimov’s new book, “A Critique of Democracy: a Guide for Neoreactionaries” does just that. I must admit, having spent the last few years quietly lurking in the outer rings of the Dark Enlightenment, I was somewhat dreading reading this book. As John Derbyshire once said, neoreactionaries are “prone to earnest philosophizing: the kind of stuff of which, for me, a little goes a long way.” Mercifully, Anissimov spares us. The book is wisely written in a compact, accessible style that anyone remotely intelligent can read, without cheapening it’s academic value. First off, let me just say right off the bat that I agree with his main thesis, which is essentially that democracy is a fatally flawed system in many ways, and we can do(and have done) better. We are not approaching Francis Fukuyama’s “End of History.” Therefore, any marginal criticisms I have should be considered as such. Anissimov comes right out with it in the opening chapter, “Against Democracy,” where he lays out nine points of contention in a condensed fashion. The most important of these in my mind is the first one, which states that “democracy incentivizes high time preference.” Candidates campaign and govern without any need to consider the implications of their policies once they are planning to leave office, let alone on future generations. It’s great to live in the present, but if you’re only going to be around to be held accountable for the immediate effect of the legislation you’re implementing, you’ll be leaving a mess for others to clean up like someone trashing his apartment throwing a party, and moving out without caring if he’ll get his deposit back. Democracy encourages “looting the present at the expense of the future.” A system which doesn’t provide incentives for long term planning, doesn’t make for a nation with good long term prospects. The only argument one could make against this is that politicians may care about their “legacy” and how they will be remembered by history, long after they leave office, and that will lead them to take into account the distant future effects of their policies. Indeed, they do. However, I’ve seen no indications that such considerations overrule the immediate requirement of placating the populace in order to gain office. They will just get a book deal later and use their memoirs to try to frame their achievements positively. Each of the nine points of criticism Anissimov makes have validity, though some will resonate more than others to different people. Another interesting chapter is one where, in “2001: A Space Odyssey” fashion, Anissimov delves into the evolutionary history of leadership at the dawn of civilization, beginning with prehistoric apes(!) and demonstrating how they operated in hierarchal groups which maintained a “dominace hierarchy.” He then goes on to make the case why Indo-Europeans were the forerunners of Western Civilization. Much of the rest of the book expands on the 9 bullet points against democracy outlined in the first chapter, going into much greater depth on them. Of course, it’s relatively easy to persuade people that flaws exist in democracy, but they tend to just shrug their shoulders and seem resigned to believe there are no better alternatives. Anyone familiar with Anissimov knows his preferred alternative is some form of traditional European monarchy. The final chapter in the book deals(mostly) with this, in large part contrasting monarchy with libertarianism. I got the impression he was attempting specifically to reach open minded libertarians(or those leaning that way) and persuade them to give monarchs a chance. This is really the only chapter of the book that I didn’t find all that persuasive, mostly because there just isn’t enough space devoted to it. While he talks about GDP, marriage rates etc, the most common objections to monarchy aren’t sufficiently addressed. The main one being of course, how to prevent or minimize corruption in an aristocracy if you have a king who doesn’t care. In an otherwise great performance in his online debate with Noah Smith, Anissimov had no good answer for this. He basically said that monarchy is a higher risk system, which offers greater rewards if we could “luck into” a perfect storm of ideal circumstances. That’s not very reassuring. There are additional considerations in a technologically advanced monarchy vs. those of the distance past. In medieval times, even though one was living under an authoritarian regime, someone residing in the countryside may have had very little contact with the government, due to the logistics of travel and lack of modern communication. Thus even in such an authoritarian system they would have had more autonomy than we do today in many respects. Yet, a monarchy with the sophisticated surveillance technology of today would potentially have security cameras everywhere as well as a substantial security network. The Shah of Iran was an effective leader, but his secret police were known to be ruthless and brutal torturers. That was in the 1970′s, imagine how much they could infiltrate your privacy today and how much damage they could do. One can’t expect Anissimov to deal with all the hypothetical questions related to a potential monarchy in this publication though, since that’s not what it’s primary purpose is. 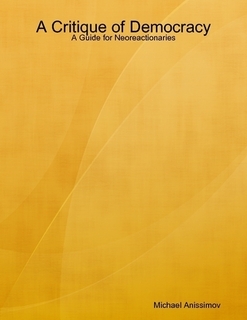 This book is a condensed guide, specifically focused on critiquing democracy. It does a very good job of what it is intended to do, and in a saner society might be required reading in high schools. I would like to see Michael produce a follow up book, exclusively advocating monarchy. Ideally it would be a book which tackles in great detail the logistics as well as theoretical problems people associate with aristocratic monarchy. It should leave no stone unturned. Anyone who is satisfied with democracy because they think it’s the “least bad among a lot of bad options” is an evolutionary “dead ender” in the world of ideas. Don’t listen to them. Worse than a bridge to nowhere, democracy is the road that led us to where we are today. We can do better. We can always do better. Decked Out Boys, an emerging rap group from Mississippi, has put out a fun new jam called “Boppin’” The video features some pretty dank, old school automobiles intercut with scenes of the group dancing(boppin’ presumably)with fans and friends in a park. The video production quality is very good, and the song itself is quite catchy. Probably my favorite component of this video is the guy who is randomly rocking the “meow we’re talking!” t-shirt with the giant cat on it. My particular notion of boppin is based more along the lines of 1950′s sock hop nostalgia, as articulated in Elton John’s, Crocodile Rock. According to Urban Dictionary though, the term has several possible meanings in modern society. Decked Out Boys are a talented and energetic young group. If this single catches on, their version of Boppin’ could become a popular thing. The song is available on their website. 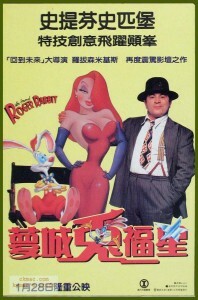 Who Framed Roger Rabbit was released in 1988. A combination of live footage film and animation. 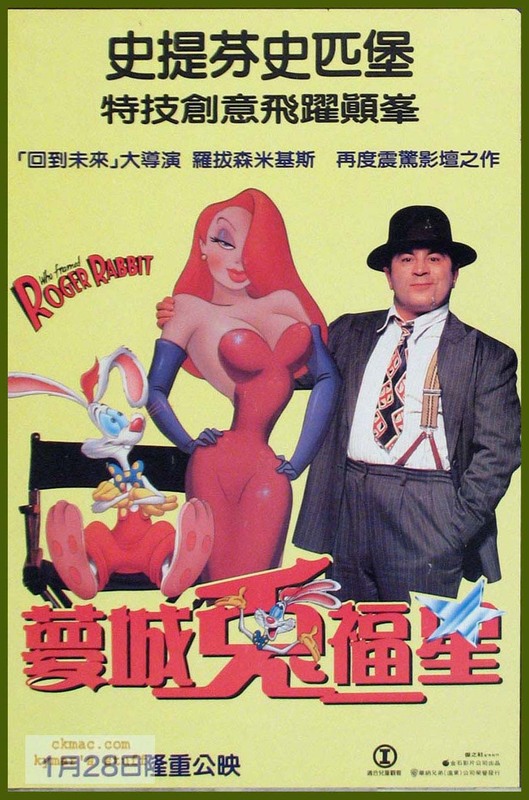 Starring the talented Bob Hoskins, and directed byRobert Zemeckis, the end results were mixed. The lasting impression for me was not the movie itself, but the experience of seeing it at the drive-in. My parents loaded up the family for a drive-in double feature of Who Framed Roger Rabbit and the movie Vibes, starring Cyndi Lauper and Jeff Goldblum. It began to rain as we drove, but my parents thought it would be fine to continue onward. We lived in Phoenix, and the drive-in was in south Scottsdale, so it wasn’t exactly nearby. The rain kept up throughout Roger Rabbit, so the window wipers were left on, which lent itself to the pseudo noir setting of the movie. The movie ended and it was still raining, so my parents decided not to stay for the second feature film. As we left the maze-like parking lot, my father got turned around, and ended up going the wrong direction through an exit, running over the ground spikes that avert traffic from going the opposite direction. So the family was stuck at the drive-in exit, with blown tires, in the rain. My father walked in the rain to the nearest payphone and called my aunt Mary for a lift, and then called a tow truck. Aunt Mary arrived to the scene, and we all packed into her VW bug, as father stayed behind waiting for the tow truck. We fell asleep on the ride back, only waling up as we arrived home. I haven’t a clue how late it was by the time father was dropped off home, but he was certainly there when I woke up the next day. For a movie that was only mediocre, I never forget the rainy circumstances of which we saw it. The mishaps and shenanigans of trying to leave, and the eventual divorce it lead to. 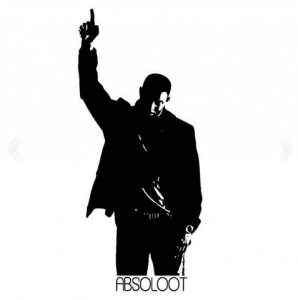 Checked out a new single from a passionate young rapper from Fort Lauderdale, “Absoloot.”This latest jam is titled “Watch Your Words.” His “speed alternating” delivery style clearly reminds me of mid 90′s Bone Thugs, though not quite as fast(does anyone rap that fast?) Absoloot’s actual voice has a jovial clarity, which gives it a bit of an old school, 80′s MC quality(some of his other songs have more an R&B feel to them.) He uses some interesting layering and echo effects with the vocals, which seem to give his verses a unique sound. The chorus, “Be careful who you serve…Watch your words” feels like it gets repeated in the song about 50 times. I listened to this song only 2 or 3 times, and that phrase was stuck in my head for days. If there is a recurring theme in his songs, it’s that Absoloot is a fairly suspicious fellow, along with being a dreamer. He tends to promote progress and cautions against banksters as well as generalized greed(he actually has songs which are titled “banksters” and “greed.”) “Watch Your Words,” with it’s crisp piano backing, is clearly the best musically and the catchiest of his songs. I recommend you give this a listen. Regardless of the situation, watching one’s words is nearly always good advice.